Is diffuse sunlight a global aurora? Just for fun I’ve decided to do a series on some of the stranger emails I get as a member of a physics and astronomy department. Loads of people write in determined that they have solved the mysteries of science and demand recognition. In each case, I will show the email, then explain the claim, then explain why it is wrong. In this first email, we see a person who demonstrates the old axiom that a little knowledge is a dangerous thing. 1- The bulk of the diffuse daylight is generated in the ionosphere by the same mechanisms that generate the polar auroras. 2- The solar X-rays and ultraviolet light are the primary origin for the energy needed to drive the global, continuous occurrence of the daytime auroral activities. 3- The global daytime auroras are capable of forming the so-called auroral corona which is the primary source of the daytime beam radiation. 4- The Sun always forms a far glowing background for the daytime auroral corona. 5- The formation of the auroral corona and concentration of its light, are both intimately related to the magnetic zenith effect. 6- The earthward spread of the light from the magnetic zenith is intimately governed by the phenomenon of aspect sensitivity. 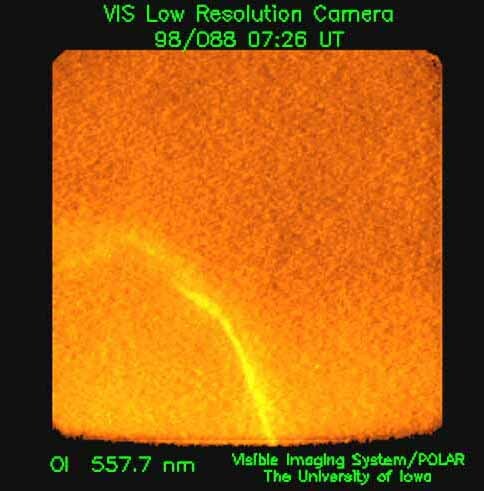 No doubt, hundreds of thousands of real images taken by the “Visible Imaging System/Polar ~V The University of Iowa/NASA-GSFC” are alone fully capable of proving Attiyah’s Sun theory. These images show that the aurorae are global and occurring continuously in the whole ionosphere. auroral UV light such as the O1 wavelength 130.4 nm could clearly show that the aurora is a permanent, global phenomenon. auroral visible wavelengths that characterize the auroral emissions, especially 557.7 nm, 630.0 nm, and 391.4 nm, could also clearly show that the aurora is a permanent, global phenomenon. (1) The filters of the cameras of UVI screen out all the scattered sunlight. In other words, no one can claim that any image captured in any wavelength characterizing the auroral light could show any glow due to the sunlight. are always active in the whole ionosphere. (1) The previously referred-to images could show that the aurorae occurring in the whole daytime ionosphere are greatly brighter not only than the IBC IV aurora, but even than the exceptionally bright aurorae that might sometimes occur in the auroral oval itself, especially during the geomagnetic storms (auroral storms). 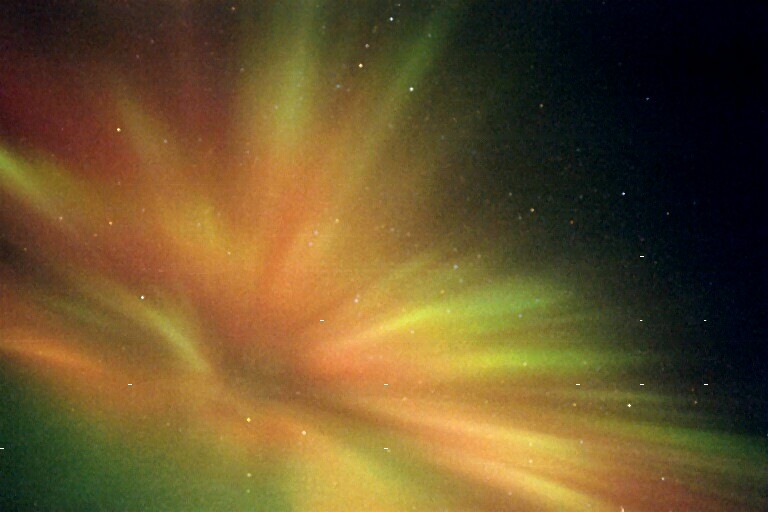 (2) Any IBC IV aurora, or even IBC III aurora, could form its own auroral corona. Analogously, the daytime aurora outside the conventional auroral zone, from the sky of the sub-auroral zone to the sky of the equator, should show a very bright auroral corona greatly brighter than the auroral corona of the conventional IBC IV aurora. (3) According to, first, the fact that the auroral corona of IBC IV aurora is as bright as the full moon and, second, the fact that even the daylight at midday cannot outshine the full moon, it could be concluded that the auroral corona of the daytime aurora of the middle and low latitudes should appear in the sky. (4) However, since, first, no auroral corona appears in the daytime sky, second, the solar beam radiation shows all the characteristics of the auroral light as well as the full behavior of the auroral corona and, third, we have not any spotlight in the daytime sky outside the solar disk that could show the aurora borealis effect (auroral corona) , or could exhibit any appearance resembling the rising sun effect, therefore, we can conclude that the solar beam radiation necessarily involves an auroral corona. Said another way, if the Sun as observed at the Earth does not involve the auroral corona of the inevitable daytime aurorae, then, this auroral corona should always appear in the daytime sky outside the solar disk itself. Really, there are no reports about seeing any auroral corona outside the solar disk in the daytime sky of any latitude. Even in the very daytime sky of the conventional auroral zone wherein the aurorae are always present in the daytime side of the auroral oval, there are no reports about seeing any auroral corona outside the solar disk not only during the geomagnetically quiet times, but even during auroral storms and geomagnetic superstorms. In aggregate, if the continuous observations of the presence of the auroral light in the whole sunward ionosphere, as well, if the continuous observations of the emission of the auroral light from the whole daytime ionosphere, do not decisively prove the global occurrence of aurorae, what, then, is there to make scientists understand Attiyah’s Sun theory and accept it? If hundreds of thousands of real images that could clearly disclose the continuous presence of the auroral light in the whole sunward ionosphere are not sufficient to be decisive evidence supporting AST, what, then, is there to make scientists agree that the aurorae are fully global? If hundreds of thousands of real images that could clearly show the continuous observation of the emission of the auroral light from the whole daytime ionosphere are not capable of proving the continuous, global occurrence of the aurorae, what, then, is there to make scientists accept AST? 3- In general, the scattered light of the daytime is spread in the troposphere, stratosphere and lower mesosphere. 4- The bulk of the diffuse daylight is generated in the ionosphere by the same mechanisms that generate the polar auroras. 5- The bulk of the scattered daylight is primarily of two main origins: solar light and ionosphere-produced light. 1- The whole ionosphere is the celestial region of the aurorosphere. 2- The aurorosphere is two global domes: the sunward dome and the antisunward dome. 3- In general, the sunward auroral dome, the daytime auroral dome, houses visual auroras. 4- In general, the antisunward auroral dome, the nighttime auroral dome, houses subvisual auroras except in the two polar auroral ovals. 5- The Earth makes a daily rotation inside the aurorosphere that is fixed relative to the Sun. 6- The aurorosphere makes a regular, annual swing in the north-south direction. The whole ionosphere is a planetary-scale glow discharge tube. Through its intimate coordination and cooperation with the rest of the magnetosphere, including Van Allen radiation belts, the ionosphere serves as a global-scale glow discharge tube. 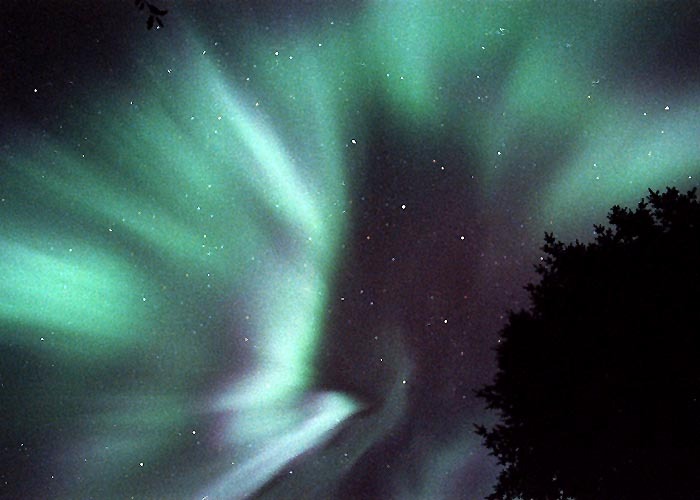 southern ones, but instead there are two series of auroral ovals: the series of the auroral ovals of the northern geomagnetic hemisphere and the series of the auroral ovals of the southern geomagnetic hemisphere. 2- The traditional northern and southern auroral ovals are only the terminal ones. 3- In between each two successive ovals there is an ionospheric trough separating them from each other. 4- Each one of the auroral ovals has two sectors: a daytime sector and a night time sector. 5- All the daytime sectors of the auroral ovals from the terminal polar one to the equatorial one are normally visual. 6- The nighttime sector of the terminal polar oval is usually visual. 7- Generally, the daytime sectors are almost optically merged. 8- The once thought of as an equatorward extension of the traditional auroral oval, particularly its nighttime sector, is virtually a sequence of transient mergings of the night time sectors of some of the successive enhanced ovals, including the traditional auroral oval as their terminal beginning. a- The northern polar cap and southern polar cap are analogous to the anode dark space and Aston dark space, respectively. b- The traditional northern auroral oval and traditional southern auroral oval are analogous to the anode glow and cathode glow, respectively. c- The anode dark space, cathode dark space and Faraday space are analogous to ionospheric troughs. In the short email above, Attiyah is explaining that he believes that diffuse daylight is caused by aurorae occurring over the entire sunward side of the Earth. The Sun is responsible for direct sunlight only and he has taken images from Earth observation satellites to show that emissions common in the aurorae are present over the sunlit side of the sky. The science of optics is a long and well travelled one, as is the science of atmospheric glows. From optics we know that there are a variety of ways to scatter light. These include Rayleigh scattering and Mie scattering. Rayleigh scattering is scattering off particles or vacancies in the sky smaller than the wavelength of light, such as atoms, Mie is the same, but for larger than the wavelength of light particles and vacancies – dust and the like. Also well known is refraction, whereby light entering the atmosphere can be bent in its path. Adding these together, we get a model of light scattered differentially in wavelength around the atmosphere. We can predict blue light to be scattered more than red, which is why we see it in the sky all around during the day. It is also why when the Sun is rising or setting we see red light shining stronger than the scattered blue. But what about the aurora-like emissions over the entire daylit side of the Earth? Well, the Sun emits more than just visible light – it sends out ultraviolet, x-rays, gamma-rays and infrared photons amongst others. All except for infrared are very capable of ripping apart atoms and molecules in the upper atmosphere. This leads to individual electrons and ions recombining and bumping about. The bumping of electrons into atoms and molecules excites them in the same way that electrons in the aurora bumping into them would (so long as they are fast enough). Recombination of ionised atmospheric constituents also leads to the same emissions as recombination of atmospheric constituents ionised by the aurora. This leads to some commonality between so called dayglow emissions and auroral emissions – essentially, high energy solar radiation and high energy electrons and protons from the aurora are ionising the same atmosphere, therefore the emissions and chemical effects from that process are likely to show some level of similarity. It does not mean a common source. Attiyah also mentions that the auroral forms he expects are present during the day producing the diffuse daylight are outshone by the Sun and so invisible – yet the highly sensitive instruments he gets pictures of can show auroral forms in the daylight – but they don’t show them where he wants them. NASA-researchers’ explanation of Polar’s images was not right. Please help me correct one of the most dangerous faults of the fundamental science that concerns every human being. I strongly feel that you are full of courage and pretty intelligent to prove that you are a truth-seeking person, and willing to be a fact-declaring scientist. As a fact declaring scientist, I am happy to help – that is not a Nasa or UI scientist’s explanation of the images you are peddling, it is a misinterpretation of the effect of dayglow, of which we are pretty sure we have a handle on.